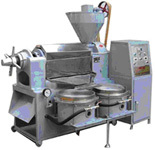 The integrated Palm Kernel Oil Presses are advance model from the oil press. These include motor, vacuum filter, heater and electric control cabinet. The assistant part can help the oil press with higher output. The function of the vacuum oil filter used to filtrate the crude oil which come out from oil press. They are an ideal choice for customers. Our large palm kernel oil presses are with big capacity which mostly use in middle-large scale oil plant. They can be divided into two kinds: One is hot processing, which includes steam cooker and oil press. The steam cooker is used for oilseeds pretreatment before pressing. The other is the cold processing. 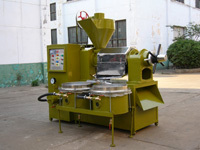 The advantage of this kind of machine is lower temperature when press the seeds. It is about 80 degree, which can protect the nutrition element in the oil. These are palm kernel oil press with big capacity, high oil output, low oil residual, light processed fats color, good quality,rich nutrient. Q1. What is palm oil? Palm oil is obtained from the flesh ("mesocarp") of the oil palm fruit. Like olive oil, palm oil is a fruit oil. Palm oil should not be mistaken for palm kernel oil which is extracted from the kernel or seed of the palm fruit. Palm oil has a balanced composition of both saturated and unsaturated fatty acids. Coupled with nature's gift of high vitamin E content, the oil is naturally very stable. Palm oil contains an equal proportion of saturated and unsaturated fatty acids. It's particularly rich in the saturated palmitic acid (44%), with substantial amounts of the monounsaturated oleic acid (40%), and smaller amounts of polyunsaturated fatty acids (10%). Palm oil has had a history of food use of over 5,000 years, and this major oil in the world's oils and fats trade is currently consumed in over 130 countries worldwide. Q2. What Is palm olein, palm stearin and super palm olein? Palm oil is semi-solid at room temperature (20°C). The liquid portion could be physically separated from the solid portion of palm oil by fractionation. After fractionation the liquid portion is called "palm olein", which is commonly bottled and sold as cooking oils. The solid fat portion is called "palm stearin" and it is commonly used to formulate trans-free fats such as margarine, shortening and vegetable ghee. Sometimes the palm olein is further fractionated to a more liquid fraction called "super palm olein". This oil fraction could withstand colder temperature than palm olein before they cloud or solidify. Q3. Is palm oil similar from palm kernel oil? No. Many people mistaken palm oil for palm kernel oil. Palm kernel oil has very different chemical composition and physical characteristics compared to palm oil (see Figure 1). Both these oils come from the same fruit but they are uniquely different. Palm oil comes from the flesh or mesocarp of the fruit while palm kernel oil comes from the kernel or seed of the fruit. Palm oil and palm kernel oil have different impact on heart disease risk due to the different composition of fatty acids. Human studies have reported that palm oil tends to be "neutral" while palm kernel oil is distinctly cholesterol-raising. Palm oil is mainly used for edible purposes while palm kernel oil is used for non-edible purposes such as making soaps, cosmetics and detergents. Q4. Is palm oil similar to coconut oil? No. Many people mistaken palm oil for coconut oil and thereby think that palm oil is similar to palm kernel oil. It is palm kernel oil that is similar to coconut oil in terms of chemical composition, physical characteristics and uses (see Figure 1). Besides fatty acid composition, palm oil also differs from coconut oil with regard to their impact on heart disease risk. Clinical trials conducted on human subjects have indicated that palm oil tends to be "neutral" while coconut oil is distinctly cholesterol-raising. Q5. Once consumed, how well is palm oil digested? Once consumed, palm oil does not remain intact in the digestive tract for long, for it's soon attacked by the digestive enzyme pancreatic lipase, breaking down the fat molecules into smaller fragments called "fatty acids and mono-glycerides". These digestive products are then absorbed. Refined palm oil and its processed fractions, palm olein and palm stearin, are in fact 95-97% digestible, which falls within the digestibility range of 93-99% for most edible oils and fats. Q6. Does palm oil contain cholesterol? No. Palm oil, like most other vegetable oils and fats, contain only traces of cholesterol (<50 µg/gram or <5 ppm). This amount is so low that it has no significant physiological effects on health. Therefore it could be considered to be "cholesterol-free". Q7. Why does palm olein sometimes turn "cloudy" or "solid"? Is the oil still safe for consumption? When the ambient temperature drops below the "cloud point" of palm olein (approximately 20°C) as happens during a cold night or weather, palm olein molecules crystalise out of solution and the oil appears cloudy. At lower temperatures, the cloudy oil then becomes solid. This is only a physical transformation and the oil is perfectly safe for consumption. The oil soon clears up when the ambient temperature rises above the "cloud point". This is similar to the water-ice phenomenon. To lower the cloud point and prevent "clouding", palm olein can be blended with any polyunsaturated vegetable oil so that this cooking oil blend would appear clear in countries with cold weather. Q8. What food products contain palm oil? Palm oil's semi-solid properties make it a favourite ingredient among the food processors. From palm oil you can have unlimited oil fractions for use of any kind of food applications. The oil could to be incorporated into a wide variety of food products which include cooking oils, margarines, noodles, shortenings, vegetable ghee, bakery products, chocolates, hot beverages, coffee creamers, and ice cream. Due to its excellent stability, palm olein is the No. 1 choice in the world as frying oil for foods such as instant noodles, French fries, potato crisps, doughnuts and fried meats and snacks. The natural solid nature of palm stearin make it most ideal for formulating solid fats such as vanaspati, margarine, shortenings and other bakery fats. More importantly, these palm fats are not hydrogenated and therefore are trans-fatty acids free. Q9. Why is a stable oil so important for frying? It's important that the cooking oil used for frying be stable, otherwise at least 3 changes in the oil can take place at an accelerated pace at the high frying temperature (>1400C): i) fat components in the oil split up to form "breakdown" products, ii) attack by air and moisture to form oxidised products, and iii) non-volatiles (called "polar materials") are formed and accumulate in the frying medium. So choose a stable cooking oil for your frying needs at home. Reach out for a bottle of palm olein, the liquid fraction of palm oil. It is a very stable edible oil because of its balanced fatty acid composition (it has moderate amount of linoleic acids and small amount of linolenic acids - the two polyunsaturated fatty acids that may polimerised easily) and high content of natural antioxidant, the vitamin E.
In order to compete with palm olein as a stable frying oil, many other vegetable oils have to be partially hydrogenated. This would increase the content of the "bad" trans fatty acids in these oils. Q10. What are trans fatty acids? Polyunsaturated edible oils are unstable because of their high content of the polyunsaturated fatty acids (PUFAs), linoleic acid (LA) and alpha-linolenic acid (ALA). These oils are therefore very susceptible to attack by air and moisture to form unhealthy oxidised compounds. As such, PUFA-rich edible oils are usually stabilised by partial hydrogenation to reduce their PUFA content. Very often, a chemical antioxidant is also added to the oil to improve shelf-life. Polyunsaturated edible oils are liquids and would need to be first "hardened" by hydrogenation in order that they may attain the semi-solid nature for manufacture of food products such as margarines, shortenings, vegetable ghee, confectionery, and bakery products. During the hydrogenation process carried out at high temperatures, the fatty acids in these oils are transformed into the trans fatty acids (TFAs) which are harmful to health. Such hydrogenated fats, containing TFAs, are also referred to as "trans fats". Q11. Is palm oil a trans fat? No. Palm oil's natural semi-solid properties and the versatility of blending with its solid fraction, palm stearin, makes hydrogenation of palm oil unnecessary. Therefore, food products containing palm oil as its sole or main fat ingredient are essentially trans-free. Q12. How do trans fats actually harm my health? Scientific research has shown that trans fats are 2 to 10 times worse than saturated fats in their overall impact on heart health. TFAs in trans fats cause havoc to your circulating blood lipids and lipoproteins, impair the function of the inner wall ("endothelium") of the arteries, and help white blood cells called "monocytes" cross the endothelium to become nasty devouring "phagocytes"- key players in the forming of fatty streaks which subsequently mature into ugly artery-clogging fatty plaques! Scientists explain that a daily intake of a few grams of TFAs can lead to an incorpoartion of these nasty fatty acid species in the cells involved in heart rhythm regulation, with a subsequent decrease in the threshold for irregular heart rhythms ("cardiac arrhythmias")- a major cause of sudden cardiac death! As if that's not bad enough, large population-based prospective studies have implicated TFAs to play a role in chronic diseases such as cancers of the breast and colon, and type 2 diabetes! Beware pregnant and lactating women out there; TFAs can interfere with essential fatty acid metabolism, impairing the formation of the respective omega-6 and omega-3 long-chain PUFA derivatives. As a result, at least two "bad" things can happen: i) the foetus does not get enough of these essential long-chain PUFA from the maternal blood and may be born with a smaller head circumference! and ii) the quality of breastmilk is adversely affected, depriving the breastfed infant of adequate long-chain PUFA nutrition. Q13. How can I tell whether a food product contains trans fat? Read the food product label. Watch out for the following words on the label which suggest that the product contains trans fat: "partially hydrogenated", "polyunsaturated margarine", "elaidic acid", and "hardened". Sometimes the amount of TFAs is included in the total saturated fatty acid count on the food label, in which case a footnote to the nutrition information may be provided to indicate the actual amount of TFAs. Alternatively, they could be separately labelled as trans fatty acids. When you're not able to get the information given above, your best bet for a trans-free product is to reach out for a palm oil-based product. Palm oil products are essentially trans-free! Q14. Is the labelling of trans fats mandatory? No, for the moment but Codex has left this to the requirements of individual national food legislations. For consumer safety and information, however, there's a push worldwide for mandatory declaration of trans fats on food labels. Nevertheless, both Codex and several countries in the world require that the amount of trans fatty acids (TFAs) be declared on the food label when a nutrition content claim is made on either one of the following 4 categories of fatty acids: saturated, monounsaturated, polyunsaturated, and TFAs. This means that when a nutrition content claim is made on any one of the 4 categories of fatty acids mentioned, the content of the other 3 categories must also be declared on the food label. The Institute of Medicine (IOM) in United States recommended that trans fat intake to be as low as possible. Canada has imposed mandatory labelling of TFA in pre-packaged foods since Jan 1, 2003. Denmark is the first country in Europe to limit the level of TFA in food to be not more than 2% since 2003. The United States will begin its mandatory labelling of TFA by Jan, 2006. Q15. Will palm oil consumption raise my blood cholesterol level? No. A re-examination of the data of some early published western studies which included palm oil, showed that when palm oil replaced the habitual fats of Western diets, blood cholesterol levels in the subjects did not go up but instead were reduced from 7% to 38%! Subsequent research conducted in the United States, Europe, Australia and Asia have firmly established that palm oil tends to be "neutral", that is does not raise nor lower blood cholesterol levels. This is because palm oil is trans-free, has only traces of the cholesterol-raising lauric plus myrisitc acids, as well as possesses a unique fat molecule configuration involving its major saturated fatty acid, palmitic acid, which renders the oil non-cholesterol raising. Besides, palm oil has a high content of special vitamin E species called "tocotrienols" which have a statin-like cholesterol lowering action. Tocotrienols and tocopherols are members of the vitamin E family, sporting the characteristic structural features of a chromanol "head" and isoprenoid "tail". However, the isoprenoid tail of tocotrienols is unsaturated while that of tocopherols is saturated. Like tocopherols, tocotrienols can exist either in the alpha-, beta-, gamma-, or delta- form called "isomers". Therefore, the vitamin E in the foods that we eat can have any combination of these 8 possible vitamin E isomers. Q17. What are the dietary sources of tooctrienols? Palm oil is nature's richest commercially-viable source of tocotrienols while smaller amounts are found in rice bran oil, germ portions of cereals like barley and rye, and coconut oil. Surprisingly, most other common vegetable oils such as corn oil, soyabean oil, canola oil and sunflower oil do not contain tocotrienols. Q18. What's so special about tocotrienols? Tocotrienols are much more powerful antioxidants than tocopherols in our body and are therefore much more efficient scavengers of damaging reactive oxygen species (ROS) produced by our body's aerobic metabolism. inhibit the growth and spread of breast cancer cells! Q19. Why is a certain brand of palm oil red in colour? Crude palm oil is very rich in natural plant pigments called "carotenoids" giving the oil a distinct orange-red colour. In conventional refining of palm oil, all the carotenoids are removed and the refined oil is no longer orange-red but instead, golden-yellow. Thanks to novel technology introduced by the Malaysian Palm Oil Industry, healthful natural carotenoids (along with vitamin E) in the native oil can now be retained in the refined product called red palm oil. Q20. What's so special about red palm oil? Red palm oil (RPO) is the only commercially-available oil that contains substantial amounts of the natural plant pigments called "carotenoids" (about 550 µg/g), as well as vitamin E (600 µg/g) comprising both tocotrienols (65%) and alpha-tocopherol (35%). Some of the carotenoids in RPO are converted to vitamin A in our body; the the rest of the carotenoids, together with vitamin E (particularly tocotrienols), are reported to play a vital role in advanced nutrition- boosting the immune system, scavenging damaging reactive oxygen species in our body, and are involved in complex mechanisms which have evolved to protect the body from chronic diseases such heart disease and cancers of the breast and skin. Q21. How much RPO to supply the RDA for vitamin A? The carotenoid composition of RPO resembles that of tomatoes, with beta-carotene (60%) and alpha-carotene (30%) forming the two main provitamin A carotenoids. As a potential source of vitamin A in the body, RPO is equivalent to about 7,000 retinol equivalents (RE) per 100 grams. This means that one teaspoon (6 grams) of RPO will supply the recommended dietary allowance (RDA) for vitamin A of a child (350-400 RE), while double this amount (12 grams) would supply the RDA for an adult (800 RE). Nature has it that the body converts whatever vitamin A it needs (on top of preformed vitamin A from foods of animal origin) from provitamin A carotenoids and there's no danger of "excess conversion".